Now that Japanese guitars are too expensive to import into the U.S.—and now that most folks understand how good Japanese guitars could be (with a good set-up)—it’s not uncommon for eBay auctions to feature “MIJ” as a positive selling point. And, now that large-scale guitar-making—except for the highest quality custom shop work—has pretty much left Korea, for a combination of economic and political reasons, attitudes are being adjusted once again. Turns out the Koreans had also gotten pretty good a making guitars. I’m sure it’s only a matter of time that “MIK” will become another compelling sales factor when you’re shopping for guitars. Dean guitars were the brainchild of suburban Chicago native Dean Zelinsky who started building the now legendary upscale, hybrid “Gibson copies” in the late 1970s, like the folks at nearby and contemporary Hamer partly in response to the perceived inattention to quality at Gibson at the time, and partly because Zelinsky liked Explorers and Vees and was annoyed that Gibson didn’t make any fancy flamed-top versions. The former reason might be a debatable point, but there’s no question that those early Deans were darned good guitars. Indeed, players thought Deans were so good they were highly successful and the company quickly expanded its offerings. Unable to keep up with demand, Dean inevitably—like virtually everyone else, in time—turned to Japan for help. 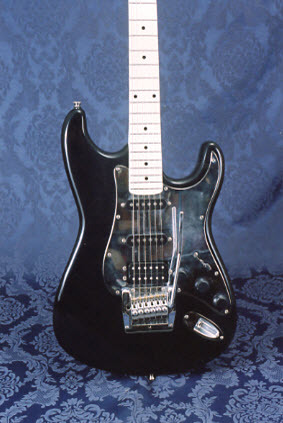 In 1983, with Guitar Player Magazine doing cover stories on the return of the Strat, Dean came up with it’s own take on a Fender with its first “Super-Strat,” the Bel Aire, one of the first guitars (there are competing candidates) to sport the now-ubiquitous h/s/s pickup configuration. 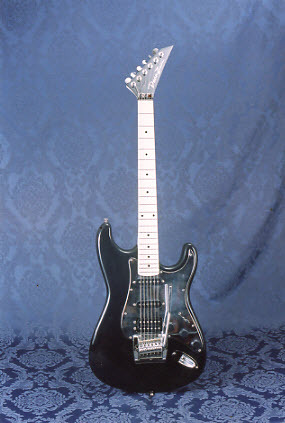 The Bel Aire had a neck and hardware imported from ESP in Japan, though final assembly continued to be Stateside. By 1985 Dean Hollywoods were made in Japan by ESP. By the end of 1985 Dean had also inked a deal to bring in Dean Autographs, like the one seen here, made in Korea. I’m actually not sure who made these guitars. 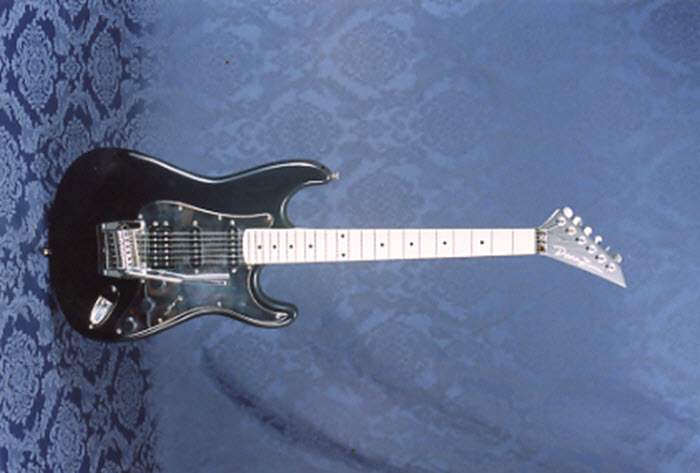 Even though Korea had (and has) a number of guitar factories, most OEM work was done by either Samick or Cort and the odds are that the Autographs came from one or the other. So, get over any contemporary reservations about Korean guitars and look at this with a modern eye, and you have to admit it’s pretty snappy! I’ve never been a fan of black guitars but make the black super-high-gloss, add a white lacquered fingerboard, and slap a mirror on the front and you have my attention. In addition to having the usual Super-Strat features, this also has a neck-tilt adjustment feature to let you fine-tune your action without taking everything apart. A lot of people obsess over pickups, which I’ve never really understood. Almost no one plays an electric guitar through a solid-state amp set to give clean, neutral sound, which is the principal way you’d get to hear mainly pure pickup. 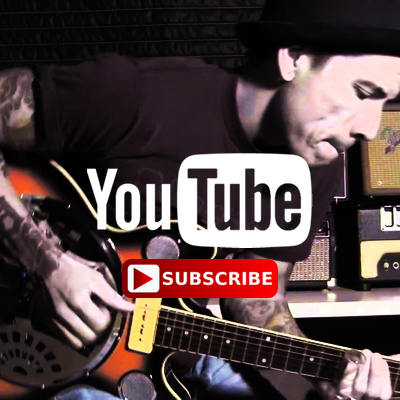 Color your sound with a tube amp, pump up the bass, or, horrors, shoot the signal through a distortion pedal with a touch of reverb, like most of us do, and as long as you’re getting some output it doesn’t really matter what pickups you have. You’re going to color the sound electronically. I’m sure that’ll rile some folks. Whether you agree with this last point or not, the Dean Autograph holds up as a swell, classy shred machine. This guitar has a serial number of 8700430. Since the Autographs were made from 1985-87, I presume the “87” is date encoding. I have no idea if these are relatively rare or common. They don’t come up for sale that often, but that many not mean much. 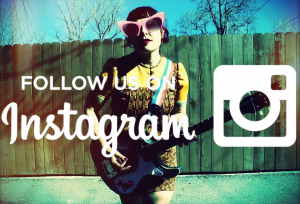 I suspect it’s a lot like 1960s Japanese guitars. They weren’t that rare (although less plentiful than most of us think), but no one ever imagined they’d be collectible in the future, so few people held onto them. By the time Zelinsky got into Korean-made guitars, he’d grown tired of the guitar biz and he shuttered the original Dean doors in 1990, off to make furniture. Will guitars like this ever become as well-thought about as Danelectros/Silvertones are now? I’m sure there are as many Korean guitars from the 80’s as there were Teiscos and Sears Catalog guitars a generation before them. I have this exact guitar. I need a tremolo for it, or a suitable replacement as I just can’t give up on it. I have the original tremolo but part of it broke, right where the front mounting screw holes are. If nothing else, I’m gonna hang it on the wall if I can’t fix/repair it. Any suggestions would be greatly appreciated. I have the same Dean Autograph,Super Strat,and need two saddles and three fine tune screws,for the tremolo. Where can I find them? 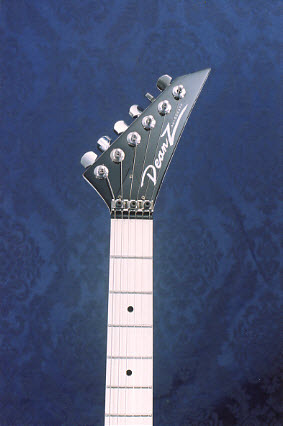 I have this same guitar but my head stock says Dean Z signature. All black with black fret. I don’t thinks it’s ebony. Maybe richlite. It sounds great. It is her heavy. Is it made of maple Mahogany combo? I have this guitar as well. I purchased it from a pawn shop in 1995. I know where you can buy one of these from a guy who dormant know what he’s got. It’s $50. I just got one for $50. I don’t know where the serial number is, and the action lower on the fretboard is pretty bad. I haven’t had a lot of time to look at it too closely, nor have I ever played with a tremolo… But for $50, I figured I’d roll the dice. I have one of these, in hot pink with mirror pick-guard , screams and sustains forever. I’d sell it for $200.